SAN JUAN, Puerto Rico A big fire erupted at an electricity plant that powers most of Puerto Rico on Wednesday, causing a blackout that swept across the U.S. territory of 3.5 million people. The Electric Power Authority said two transmission lines of 230,000 volts each failed. Executive Director Javier Quintana told reporters that he expected most power to be restored by Thursday morning, adding that airports, hospitals, police stations and water plants would get priority. 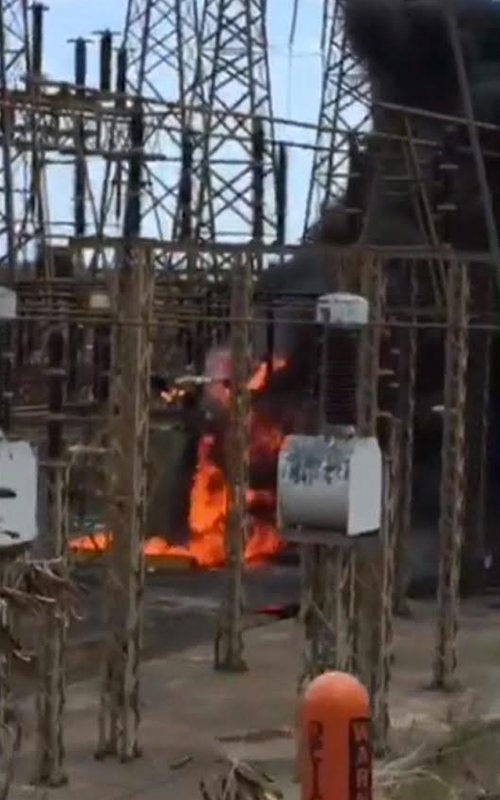 He said firefighters extinguished the blaze at the southern power plant, which serves a majority of customers on the island. Gov. Alejandro Garcia Padilla told reporters the fire began in a switch and initially destroyed a system that provides 30 percent of Puerto Rico’s overall power. He did not directly answer a question about whether the power company has any kind of backup should another similar situation occur, or if the island was hit by a major hurricane. The power company is struggling with a $9 billion debt that it hopes to restructure as it faces numerous corruption allegations. Company officials have said they are seeking more revenue to update what they say is outdated equipment. Garcia, however, said that no amount of money or maintenance would have prevented the fire. Authorities said the outage caused 15 fires across Puerto Rico as a result of malfunctioning generators, including at the upscale Vanderbilt hotel in the popular tourist area of Condado and at the mayor’s office in the northern coastal town of Catano. All those fires were put out and no one was injured, officials said. The outage also affected water service across the island, with officials urging customers to be prudent in their usage. The blackout snarled road traffic and the government had to cancel train service in the capital of San Juan and close a busy traffic tunnel in the south. Businesses, universities and government offices shuttered early, creating even more chaos on roads. A police officer directing traffic was hit and taken to the hospital. “I call on people to cooperate and respect drivers and government officials ... to avoid any regrettable incidents,” Transportation Secretary Miguel Torres said. The outage angered many Puerto Ricans who are struggling with power bills that are on average twice that of the U.S. mainland. People took to social media to demand where exactly their money is going. Puerto Rico is mired in a decade-long economic slump, and a newly created federal control board is working to restructure nearly $70 billion in public debt that the governor has said is unpayable.